Our classroom rules are based off of our PBIS program. Below is a letter from our principal, Mr. Smith, explaining how it works. St. Francis Xavier Catholic School is adopting a new behavior program called PBIS (Positive Behavior Intervention and Supports). A core team of teachers has been established and have attended trainings last year and will continue to attend trainings this year. PBIS is a proactive and positive approach to discipline. The first component of PBIS is to teach the expectations in the school so that there is a common language used throughout the school. The students will walk to each common area and practice the expectations for that area. For example, students will walk to the lunchroom and practice the lunchroom expectations in the actual lunchroom. There are posters with the expectations displayed in each classroom and in the common areas. The second component is to teach positive character traits that will help students remember how to behave appropriately in every area of the school. Students will be hearing about being Xavier STRONG during the entire school year. STRONG is an acronym for Service, Trustworthy, Respect, GOd-centered, Notice, and Good Choices. 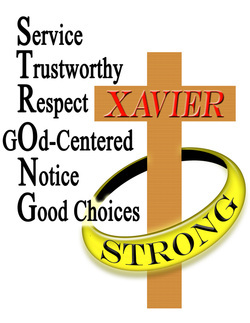 Each letter in the word strong is a trait or quality Xavier students will learn about all year. appropriate behavior. The interventions will be monitored and adjusted to fit the needs of each student. If you have any questions about Xavier STRONG, please feel free to contact your child's teacher or you may contact Cindy Roberts, Xavier guidance counselor, at croberts@xavier.pvt.k12.ia.us. We look forward to having a very positive, Xavier STRONG year!